“Hi, It is one month ago today since the guys left for Fox Creek. We are not hearing much from them and when we do talk on the phone it is brief. They are half way through the 2014 battle. Ian sounds exhausted but still positive.” This is the recent message received from Carole Koop, mother of Ian Koop. Ian and three comrades packed up their gear on January 23rd, 2014 and headed off to the Fox Creek region in Alberta to join the 2014 battle against the pine beetle infestation. Crews from British Columbia and Ian’s crews from Alberta have been contracted to cut down and burn 24,000 trees in a project that is to be completed in two months. Once the snow has melted fire bans are implemented because the risk of starting a forest fire and the 2014 battle ends. Mountain pine beetles mass attack and kill mature pine trees within a year. In mid-summer, the adults bore into large host trees and lay eggs just under the bark. The larvae hatch and feed in the tissue between the bark and the wood. Larvae develop into pupae, then to adult, and fly to the next host. The lifecycle normally takes one year to complete. The following spring, the needles of the attacked tree fade to yellow and then to reddish-brown. Alain is very proficient at making neat and packed piles. 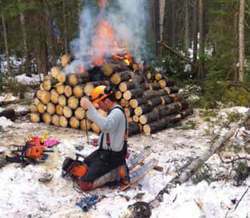 Once the pile is started, he sets fire to the first layer and the crew keeps adding logs to it. “One fire had 18 trees in it. That’s because they were close enough to be dragged to the same pile but it’s not always that easy.” The piles burn throughout the night and when the wood piles do not burn completely, the workers have to do some restacking and light them up again the next day. This consumes valuable time that could be used to cut, pile and burn trees in new locations. The workers are paid by the number of trees cut and burnt. Since the beetles only infect tree trunks more than 4 inches in diameter the branches and thinner stems can be left on the forest floor to decay. They bring all the chain saws in at night to sharpen them and also store their chain saw oil indoors. The gravel road to the job site is topped with very sharp rocks thus the flat tires for Ian and other crews. They use snowshoes for part of the trek in and Ian broke one and so he’s busy trying to find a replacement. Yesterday it was slashed tires and a snowmobile through the ice. Ian spent $850 on a Sunday service call to have someone come out to the job site to fix three tires which probably won’t stay fixed. He rescued the sled thanks to the aid of someone else. The GPS signals the trees but it does not tell the guys how to find the exact locations. Last week Ian & Alain drove 5.5 km. weaving through the trees to find the site indicated by the GPS coordinates. Once the spot was found they could see that yes, there is a shorter way to get there and it should really only have been a 1 km trip. Valuable time wasted. An ongoing challenge is staying dry. The trees are heavily covered in snow. When Ian cuts a groove in the tree and then taps in wedges to direct its fall, he’s hit with an avalanche of snow. On warm days he’s working in less outerwear and so he gets quite wet. Then because he’s soaked he gets cold. Luckily there’s always a fire near. The deadline for the work is March 27.